Boulder Bay is a small cove directly north of the army camp and facing towards New Brighton. It takes its name from the large number of boulders strewn along the waters edge. It has been home to a small tight-knit community of holiday homes (baches/cribs) from as early as the 19th century. There is no road access to the bay, though residents are able to drive through the Godley Head Reserve to a carpark near the cliff edge west of the Taylor Battery site. From here they are able to walk down to the bay. There is also access by a walking track from Taylors Mistake. At the outbreak of World War II a bogus battery, consisting of two telegraph poles and tarpaulins, was mounted above Boulder Bay but the wind soon dispensed with the tarpaulins and the deception was abandoned. The photograph is of a bach built by a Godley Head lighthouse keeper in the 1920’s. This is a bay lying to the northwest of Godley Head between Whitewash Head and Penguin Point. The name is said to have been given when Captain Taylor of the US ship Vulga mistook the bay for the entrance to Lyttelton Harbour. Though more likely it was mistaken as the entrance to Sumner Bay. The Maori name is Te Onepoto which probably refers to the short strip of fine beach, white with ground up shells. The bay has supported a community of holiday homes for many years. During the war most of the homes were requisitioned for Army accommodation. Though, people for whom the bay was their primary accommodation were allowed to live there and were even given a special pass to access the area. 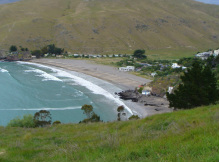 This shallow bay lies on the South side of Godley Head, within Lyttelton Harbour. The origins of the name Mechanics Bay is at present unknown. 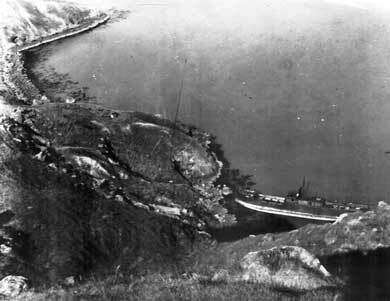 As packing in supplies for the lighthouse proved difficult, a jetty was established on the East side of Mechanics Bay where the lighthouse supply ship was able to unload cargo. Originally known as Nor-West Bay, it is the next cove up the harbour from Mechanics Bay. It gained the name Breeze Bay after the coastal vessel Breeze was beached there and abandoned by the New Zealand Navy in 1921. The Navy was towing the Breeze to sea to act as a gunnery target when it broke loose and drifted ashore in Nor-West Bay. Eventually the Navy sunk it with charges and the vessel disintegrated over the years until there is currently little sign of it.